I kept mentioning this in the forum from time to time and I’m happy to release the first batch of WeatherShields which is now available in the shop. 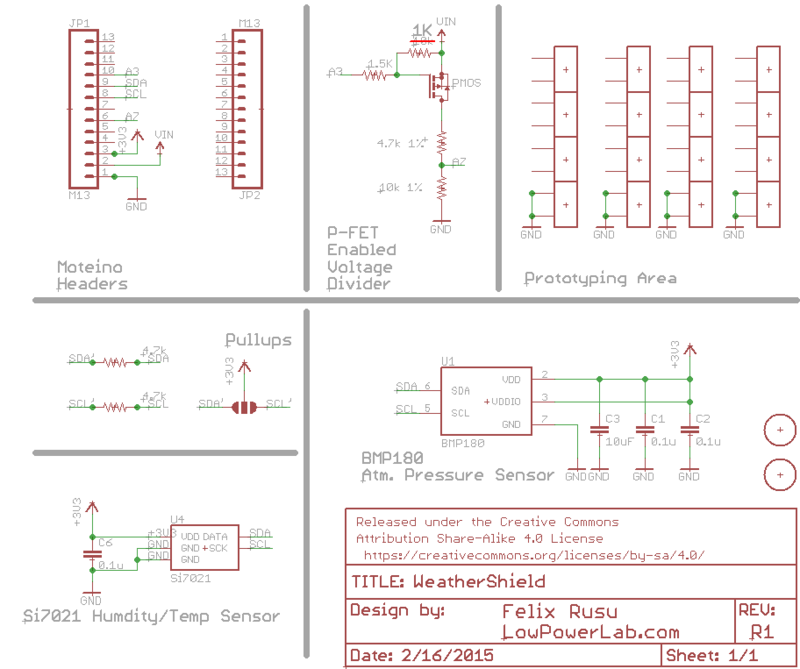 These are highly accurate I2C temperature/humidity (Si7021) and atmospheric pressure (BMP180) sensors. Credit goes where it’s due – this was inspired by this forum post and its author mr. A, but it’s somewhat different than the one presented there. 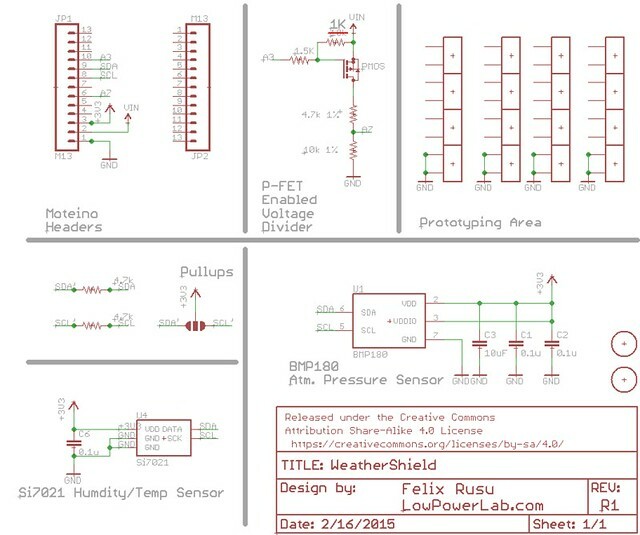 There is a sample sketch to read the data from this shield, schematics is at the end of this post. Best of all these sensors are very low power! The Si7021 has an active conversion consumption of 150uA and standby of 60nA, and BMP180 ranges between 3-12uA in active mode and 0.1uA in standby. Onboard P-mosfet driven VIN/battery monitor. This is a VIN-4.7k+10K-GND voltage divider that can be enabled by setting A3 to OUTPUT LOW and reading the VIN voltage on A7, then disabling it to save power by setting A3 to INPUT (HighZ which disconnects any battery drain through this circuit). These are much different than popular hobby sensors like DS18B20 or DHT11/DHT22 which are in a different price range and much more limited, so they are not meant to be general purpose sensors. 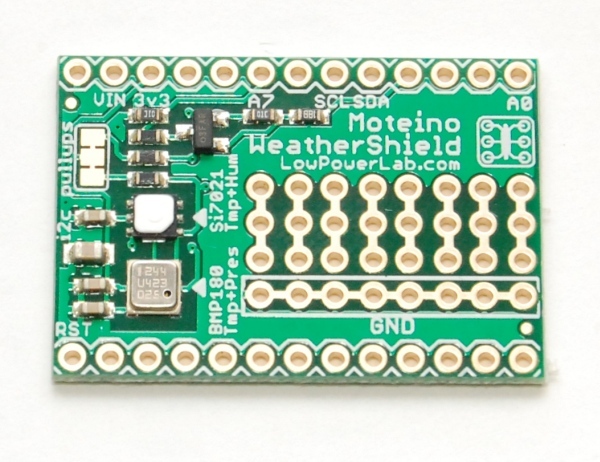 These boards come at a price and instead they are precision sensors for serious weather monitoring enthusiasts and offer a set of features which makes them very battery/remote monitoring friendly and along with Moteino they can make a very small battery operated node. There is a battery friendly sketch available. This entry was posted in New products, WeatherShield and tagged Moteino, WeatherShield by Felix. Bookmark the permalink. Si7021 has a min. readable temperature of -10 Celsius degrees. No less. Is that true? 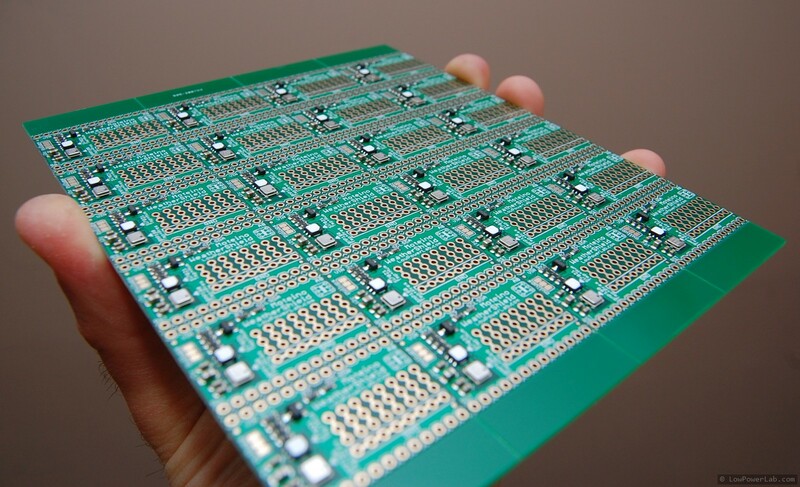 What kind od mosfet did you use to turn on the voltage divider? I’m curious becouse looking for low voltage gate threshold one (2.1-3.3 for mosfet to be full opened). -10°C? Where did you read that? Based on http://www.silabs.com/Support%20Documents/TechnicalDocs/Si7021.pdf I though that the -40 up to 85 degrees is a operating range of the sensor itself. The range of temperature being possible to measure is -10 up to 85 degrees (high accuracy temperature sensor parameter) .